Manila, Philippines. URBAN poor leaders trooped to Mendiola today, National Heroes’ Day, denouncing the government’s plan to demolish informal settlements of 25,000 men, women, and children. “Today is National Heroes’ Day. Metro Manila Development Authority’s (MMDA) chairman is named Bayani, but his actions are not of a hero. In fact he betrays the ideals and principles that our heroes fought for – to champion the interest of the masses. Implementing the plan to demolish our houses is a concrete manifestation of his continuing insensibility to the plight of the poor, thus making him a villain rather than a hero to the urban poor,” said Von Mesina of Kilos Maralita, a coalition of urban poor organizations. MMDA is the agency that would spearhead the demolitions of urban poor houses affected by government priority infrastructure projects and those living along the so-called “danger zones,” on the recommendation of the Metro Manila Inter-Agency Committee (MMIAC). Created by Executive Order 803, MMIAC is the office in charge of decongesting the metropolis and providing housing for affected families. “Real heroes like Jose Rizal, Andres Bonifacio, Tandang Sora, Apolinario Mabini, and Ninoy Aquino sacrificed for the people, but Bayani Fernando and Gloria M. Arroyo are sacrificing the people especially the poor in exchange for beautification and pro-rich development of the Metropolis,” Mesina said. The protesters wearing masks of the national heroes tore a symbolic copy of EO 803 as a re-enactment of “Cry of Pugadlawin” when Katipuneros tore their cedulas in protest of Spanish colonial and repressive rule. The protesters cried “justice for the poor.” They said that if these heroes were alive today, they would also protest against the government’s anti-poor policies. Kilos Maralita, Task Force Anti-Eviction, and other urban poor groups who joined the rally called on Gloria Arroyo, Bayani Fernando, and other government officials involved to immediately drop the plan to demolish the homes of more than 5,000 urban poor families. They urge the government to, in stead proclaim public domains and expropriate private lands presently occupied by informal settlers. “MMDA’s orientation is to demolish houses, not to build. Appointing Bayani Fernando as head of MMIAC is like appointing General Jovito Palparan as chairman of the Commission on Human Rights. It places the urban poor in a more precarious situation,” said Noel Cano of Ugnayan ng Mamamayan Laban sa Kahirapan (UMALAB-KA), a member organization of Kilos Maralita. Cano is a resident of Damayang Lagi in Quezon City, one of the communities included in MMIAC ‘s list of communities that are subject to demolition. The list was released earlier by Fernando. “We are not against development. But we are against exclusive development where the urban poor are excluded. Throwing us out of the city is not just and humane especially in this time of crisis and against every persons right to live a life with dignity. We, the urban poor, need opportunities for employment and livelihood programs, access to essential, and basic services like clean water and electricity, health care, security of shelter in the city, and all other requirements to live a humane life,” said Jose Morales of Task Force Anti-Eviction. NUPCO press release: SONA ng MARALITA, HINDI SONA ng MASALITA! Sa community, HINDI sa Commonwealth! “The true state of the nation can be seen in the urban poor communities where people live in extreme poverty, without food and decent shelters and where social services cannot be felt” – this was how the coalition of urban poor organizations in the country described the present national situation. The National Urban Poor Coalition (NUPCO) stressed that the destitute situation of the people in many communities in the country especially in urban centers like Metro Manila is the primary reason why the urban poor groups would rather conduct its SONA in their communities rather than hear the President’s SONA in Commonwealth Avenue. “In this country, we have no common wealth as almost all goods and services have been privatized leaving the poor with nothing for themselves, not even a humane shelter,” said the urban poor coalition. “However, on July 28, as GMA will report in her SONA how many houses have been built for the poor among other so-called “accomplishments” her administration has, millions of Filipinos are still living under inhumane condition, without decent houses,” said NUPCO. 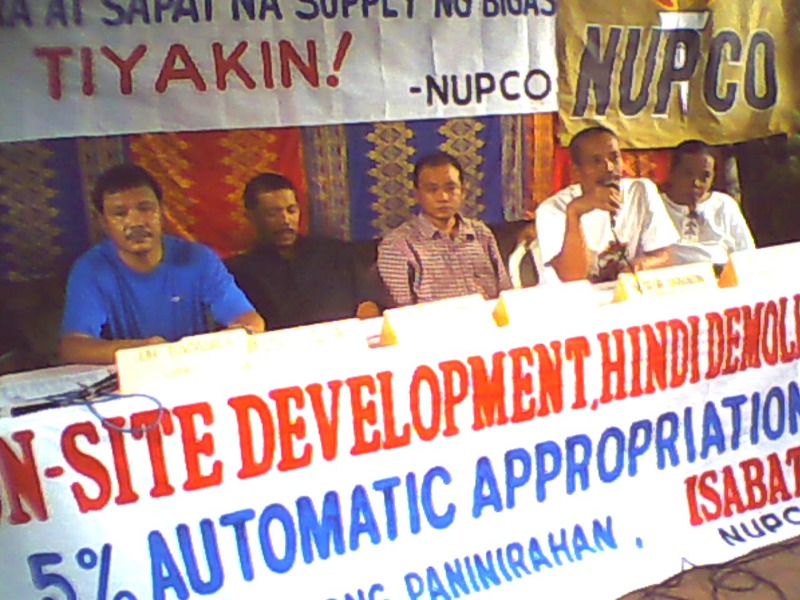 Among them are those promised with land and houses by GMA in 2001 and those who were relocated but who later returned to informal settlements in Metro Manila because “there is nothing there.” NUPCO believes that “the government’s program is flawed in a major way, poor people want and need a place in the city, not at the foothills of Montalban. “Humane housing, decent jobs, basic services like education, health, water and electricity, and affordable and ample supply of rice are what the Filipinos especially the urban poor need today more than ever. We have been asking for these for so long from the government,” NUPCO reiterated. NUPCO will hold series of community protest actions beginning today, July 24, until the day of the state of the nation address on July 28 to highlight their demands addressed to GMA. At 6pm of July 24, the series of community actions will kick off at Parola Compound where a hundred slum dwellers in Parola are expected to gather in front of Gate 20 where they will hold a candlelighting to symbolize the glaring truth of poverty in contrast with what they are expecting to be a SONA full of promises and empty rhetoric of progress. Noise barrage that will ensue is what they called as noise from empty stomach of the poor. The residents are demanding the immediate implementation and expansion of the coverage of Presidential Proclamations 96 and 571 declaring parcels of land in Parola and Binondo for socialized housing. NUPCO member organizations Pambansang Katipunan ng Maralitang Pilipino (PKMP) and League of Urban Poor for Action (LUPA) shall lead the local protest action in this area. “The forthcoming SONA of the President of Crises Gloria Macapagal Arroyo will be as usual, full of promises and empty rhetoric of progress bereft of the realities of poverty hammering the vast populace of the Filipino people including the urban poor,” said Von Mesina, NUPCO National Council member and Secretary General of PKMP. “What we need is food on the table and not statistical progress as what GMA and her cohorts are providing this nation and the poor, NO FOOD, NO PROGRESS!” Mesina added. “Look at us. We have nothing. No jobs, no formal education, no assured food on the table, no healthcare, NOTHING! What is left is our dignity. The dignity to force GMA to implement Proclamation 96 issued in 2001 and 571 issued in 2004 declaring parts of Parola Compound as land for socialized housing which she herself proclaimed and to fight for expanding the coverage of the proclamation and arrest the decades-long problem of security of land tenure of the people of Parola Compound and Isla Puting Bato. The dignity to fight for our right to life hindered by lack of sustainable jobs compound the high cost of rice and transportation. We only have the dignity to fight for our rights to HUMANE HOUSING AND DIGNIFIED LIVING!” said Joel Sacaguing, a local leader of PKMP. Until now, despite the two proclamations issued by GMA, there is no realization of Parola residents’ wish and claim to rights to own the land they are occupying and security of land tenure. The groups asserted that GMA only used these proclamations to pacify residents who are known to distrust and dislike her. NUPCO is a coalition of urban poor organizations nationwide. Its advocacy is to fight for HUMANE HOUSING AND DIGNIFIED LIVING FOR THE POOR.